How to drill holes in metal safely and what to use for different types of metal. Understand how different metals can be drilled most effectively. Find out about the different types of bit that are available for which type of metal and metal sheet. When drilling metal there a few important items you will need. When purchasing drill bits it is always worth spending money and getting decent drill bits. It will make your job quicker and safe. Cheap drill bits go blunt very quickly, catch in the work and can be dangerous. Always make sure what ever you are drilling is fixed securely. You will need both your hands free to complete this task and always take your time when drilling metal. You need to get this task right first time as you never really get a second chance with drilling metal. Filler is not an option here! Before drilling your hole in metal you should always mark your drilling point either by scribing ‘X’ or by using a center punch to mark your point of drilling. This also acts as a guide for your drill bit. If drilling through thin sheet metal it is always advisable to have wood placed underneath what you are drilling in order to protect the reverse side of the metal sheet and also the drill bit when it passes through the piece. Make sure your piece is clamped to a work bench or in a vice. You could use a pillar drill if the object you are drilling will allow for total safety and control. When drilling through metal to make a larger hole you can use a step by step procedure of drilling a small hole or pilot hole and increasing each drill action with a larger bit until the size you require has been achieved. There is also another drill bit on the market which will produce the same finished required hole size without changing bits. This is called a cone, or step drill bit. The cone or step bit simply increases the size of the hole the further in you drill. 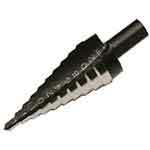 Click on the image to buy the cone drill bit. When drilling hard metals at high speed and using high force, you need to use a metal working lubricant (you can also use WD40 or 3 in 1 oil) to cool the item being drilled. A rule of thumb when drilling metal is: the bigger the drill bit the slower the speed of the drill. Below are different types of drill bits available to use in order of increasing strength. As always, DIY Doctor always recommends that protective gloves, dust masks and eye protection should always be used.